Looking into the vast open Aether of the Sphere. AETHER CLOUDS are beginning to gather. We can see small islands of LANDS dotted here and there. 1. CAPTION/Sabre:	“The Aether foams and storms, this is well known. 2. CAPTION/Sabre:	“And most of those storms are harmless, the damage they wreak minor. Closer on the CLOUDS… or are the CLOUDS growing that much larger? 3. CAPTION/Sabre:	“But rarely, every century or so, the Great Storms come. It’s magnificent and terrifying, now, the CLOUDS of MANIFEST AETHER, bolts of energy shooting and sheeting within, swirling towards us like a massive, churning wave. 8. CAPTION/Sabre:	“…and grow hungry. We’re on the leading edge of some nameless, lost to memory Land. A MAN is at work on his home, here. And in the distance, we can see the STORM coming in. The MAN has looked up, seeing the STORM. His FAMILY has rushed outside to see – WIFE and CHILD. 3. CAPTION/Sabre:	“The land heaves, tears itself in twain, erupts in volcanic, liquid fire. 4. CAPTION/Sabre:	“That which was fertile becomes barren, that which was desiccated blooms. 5. CAPTION/Sabre:	“The famines that ravaged Fueille in the last century? The legacy of a Great Storm. Wow – that’s some awesome art there. I’m not very big on comics generally because visual art doesn’t work for me as well as straight print. But I’m really impressed by how still pictures can convey movement and story – the gunfights, entering the aether, and the storms all seem nearly alive to me. It’s sad to hear you say that about your reaction to comics, James, but I understand. If you’ve come to comics in the last ten to fifteen years you’ve experienced art that doesn’t tell the story. It’s definitely a matter of style over substance. What I see as my job here is to visually interpret and dramatically enhance Greg’s story. I want the reader to look at a panel and know exactly what’s happening. There’s ample evidence on this site that I am not a great artist, nor am I a distinctive stylist. What I attempt to do is be the best visual storyteller I can be. There’s no question my attention to this ethic has cost me a lot of work over the last 10 years, but I see that as the job. One suggestion: take a look at some reprints of older stuff, check out the classic storytellers, the guys who invented this art form. Guys like Will Eisner, Harvey Kurtzman, Jack Kirby, Alex Toth, Joe Kubert, and dozens of others. Stylistically they’re all over the map, there’s bound to be something there you like. Don’t give up on the medium. It’s vibrant and exciting, and at its best, as good as any other medium for telling a compelling story. Whoah whoah whoah. Whoah. Are you trying to say that the job of a comic book artist isn’t to simply draw muscular men and scantily-clad women in dramatic, static poses? This is an outrage, sirrah! An outrage I say! I know! I’ve have this discussion with Rick time and time again, and it’s like he just doesn’t listen! I tell him, change Sabre’s clothes, we’ll get more readers! And what does he do?!? He changes her clothes! Into more clothes! It’s scandalous! Missing the “are” from caption 2–or some sort of punctuation. I know I had to read it a couple of times to make sure I had the correct meaning. “…and grow hungry”: pure awesome. So if you had that map, you could make a lot of money land prospecting. Buy up dry, fallow worldlets right before the next storm hits, then sell them at a profit. But I’m guessing Sabre had bigger plans than that. Does the map help predict when new Lands appear and old ones get swallowed by the Aether? Would be that is the reason “The Smoke” is interested. I don’t think being even a mile underground would save them, in this instance. They’d better pray there’s an Oz to be flashed into. I will say this. Your art may not be the most gorgeous of work I’ve seen (though it’s damn fine), but you sure know how to impart motion and life into your drawings. This comic drew me in, kept me under, and just now let me draw breath. 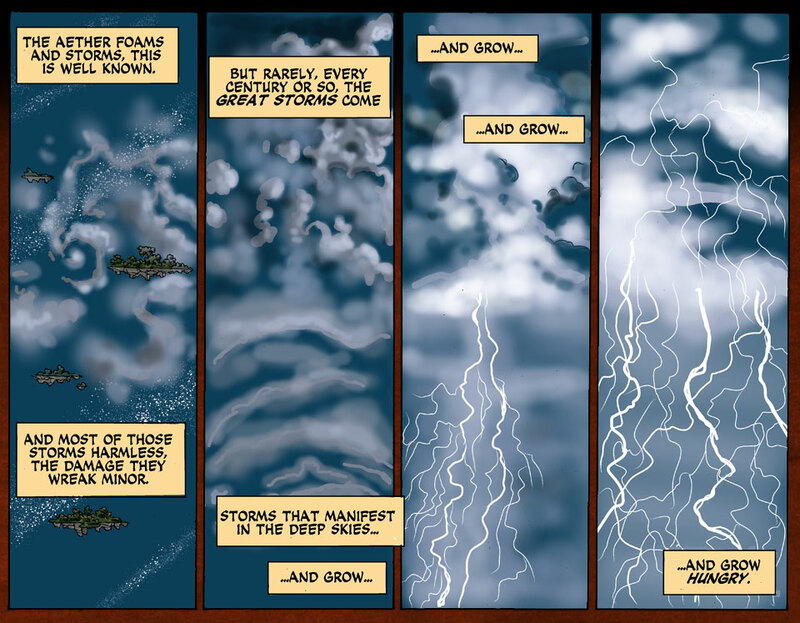 Looking at this sequence I like the concept immensely and the scale of the storm is well conveyed. I would have liked closer views of the people involved, their fear-filled faces, making them real and human as well as puppets destroyed by larger forces. I found I was unmoved by their fate. 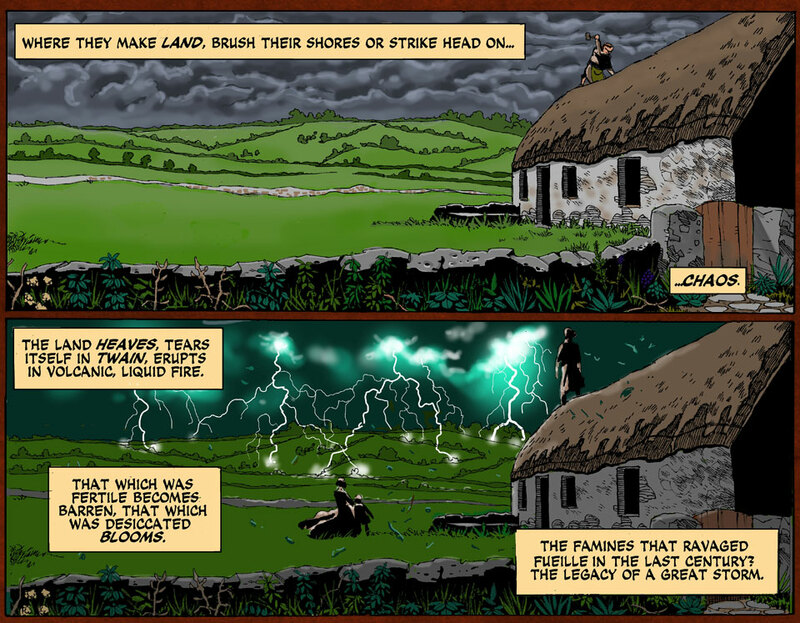 It would also be interesting to visually change the forked lightning. Lightning jags are a well-used image and convey power and danger, but not strangeness. Perhaps a rounding or morphing of the lightning would add that element. In the final frame there is, for me, too little visual commonality with the previous frames – it is not clear, without reading the accompanying transcription that the animal was one of the humans in the preceding frames. Please be assured that these remarks are positively and respectfully intended. I admire the inventiveness and craftsmanship of this series immensely. It needn’t have been clearer; the association is meant to be subtle, and to allow the reader to draw that conclusion in their own time. This is a visually told story; the scripts are posted as an adjunct, not as a requirement. Or, to put it another way, I didn’t want shock. I wanted you to have to think about what this means, and the potential it reveals.